We had the most wonderful yiayia (grandmother) you could imagine. 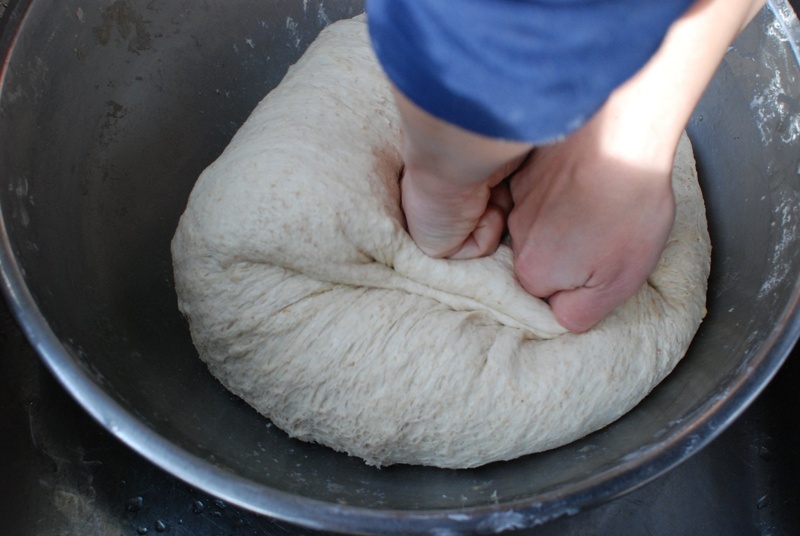 She was sweet and fun, and was always ready to give family, friends, and strangers a hug and a smile…and bread. 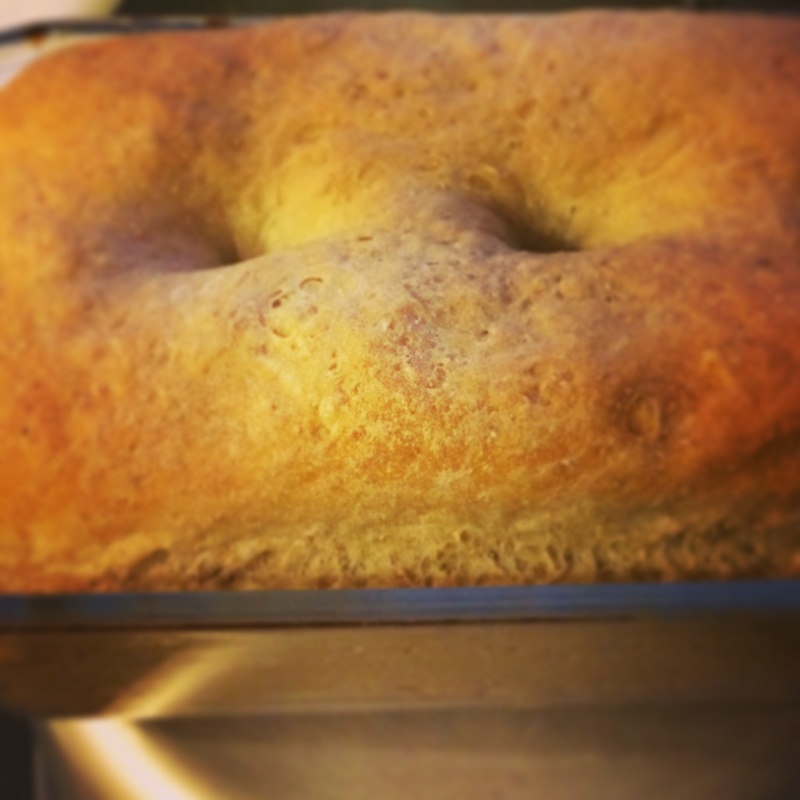 Yiayia made this amazing bread, by hand, every week. 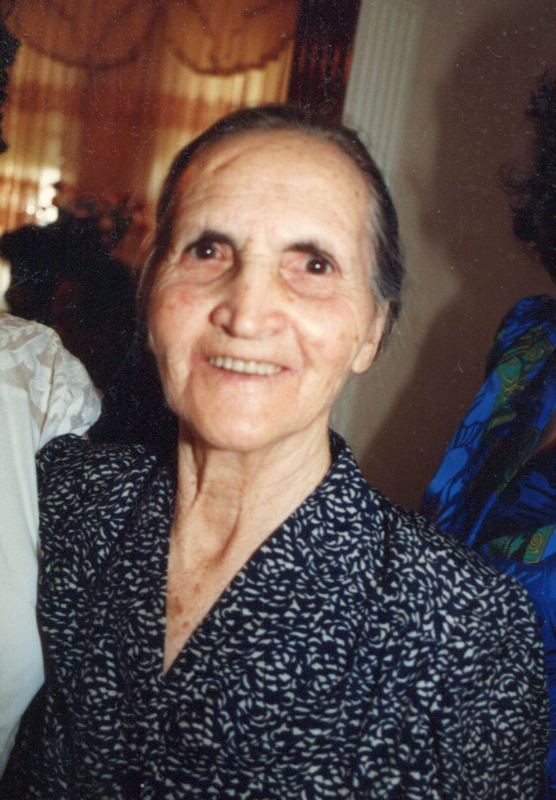 Yiayia’s bread was on our table at every meal and while it always tasted good, to eat it fresh out of the oven was complete joy. 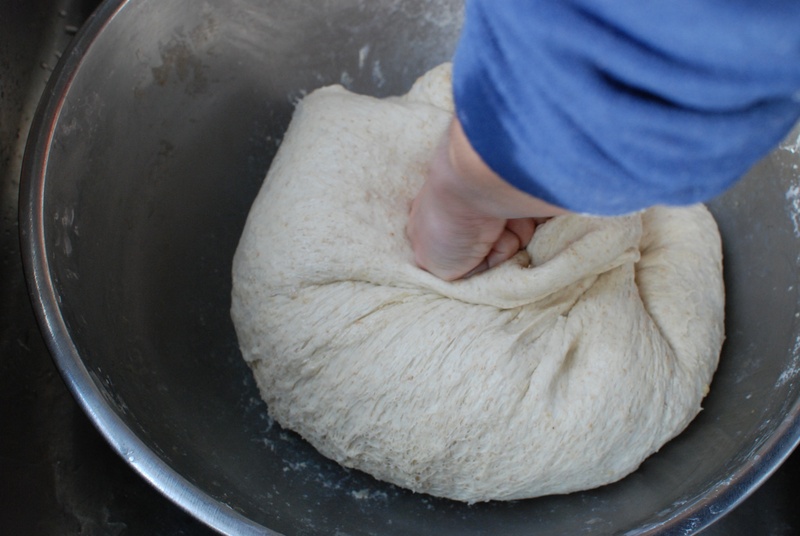 Our mother and aunt still make this bread a couple of times a month, and took the time to teach us the recipe, but to us this will always be yiayia’s bread. 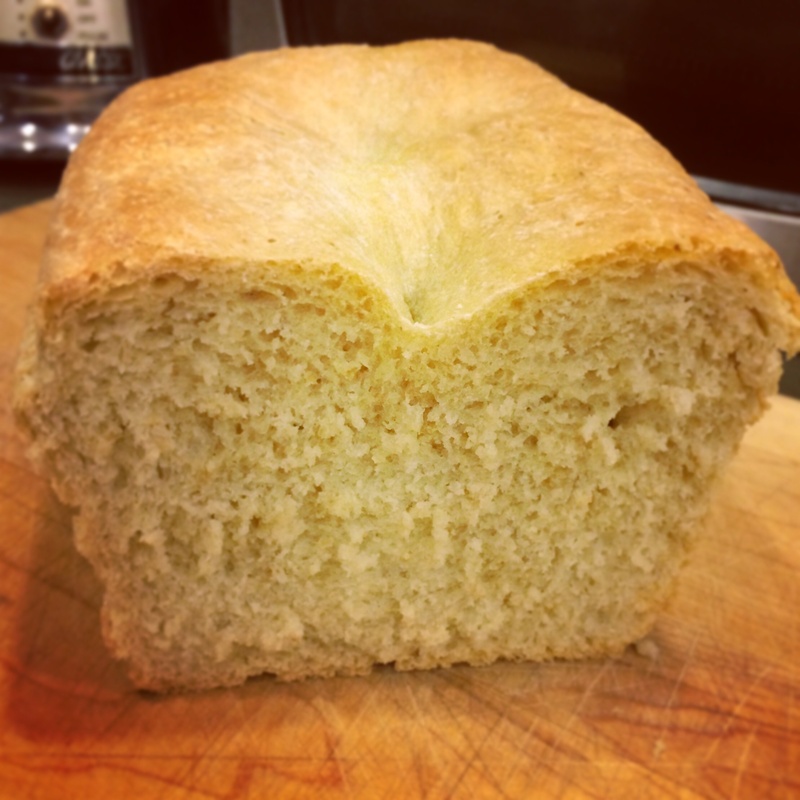 She was a special lady, and this is her famous bread. 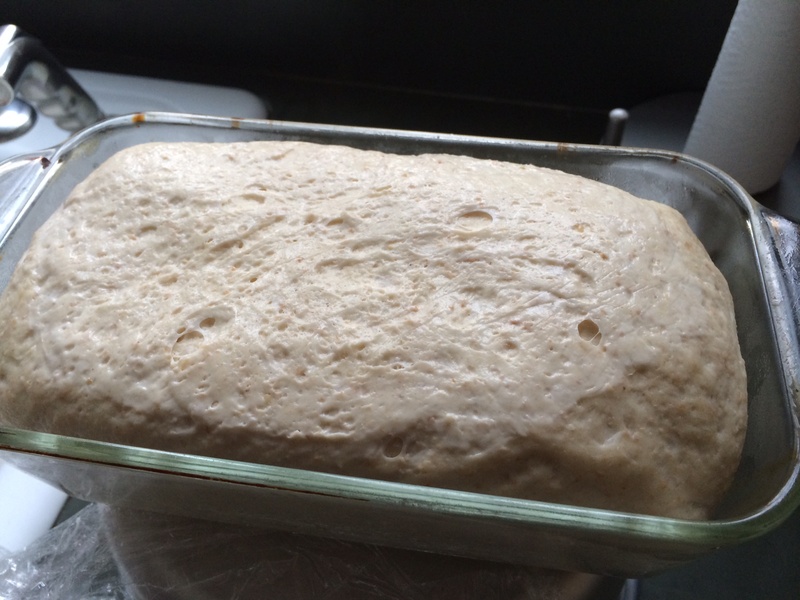 Combine yeast and 2 cups warm water and set aside to allow yeast to activate. 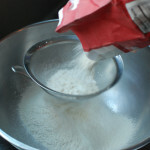 Sift white and wheat flour into a large bowl to aerate the flour. 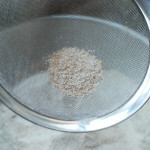 After you sift the wheat flour there may be larger wheat husks left behind in the sifter. Add those into the bowl, too. 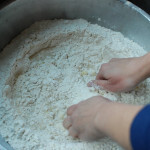 Add salt and combine with your hands. 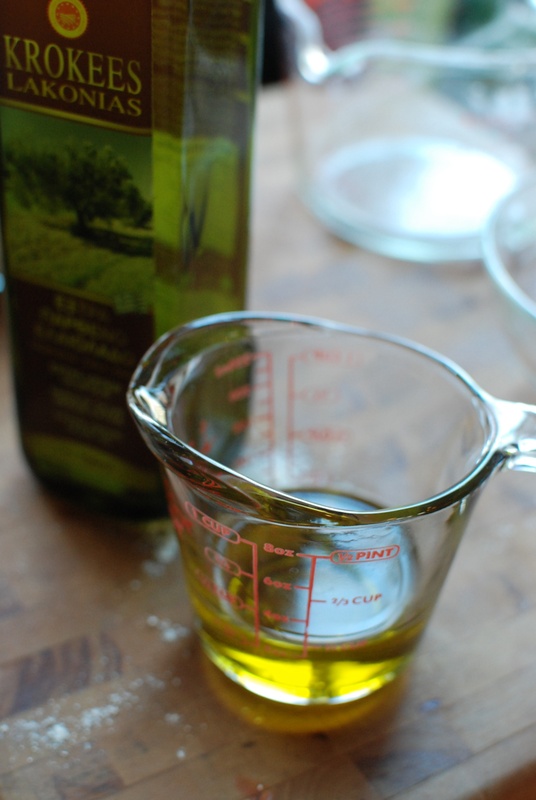 Make a well in the center and add oil. 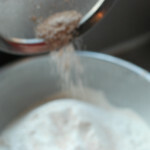 Stir reserved yeast and water to combine and add to the well. 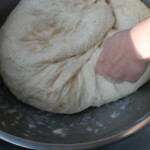 Knead the dough until it is sticky and tough and pulls away from the bowl. 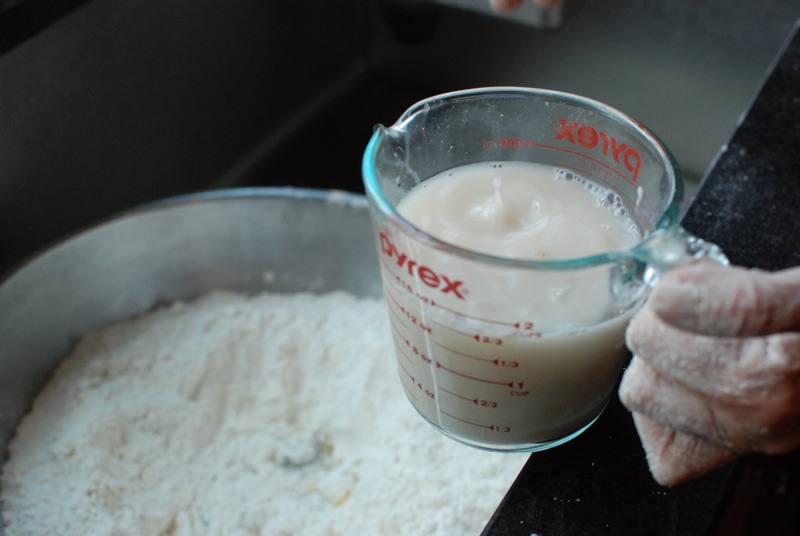 Fill a large bowl with 3-4 cups of warm water. 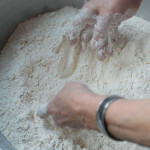 Wet your hands in the warm water and continue to knead the dough, repeating this process (wet hands, knead) until the dough has softened up a bit, the sides of the bowl are clean, and excess water has been absorbed. Cover the bowl with plastic wrap and blankets to keep warm and let the dough rise for 2 hours, or until the dough has doubled in size and springs back when you press on it. 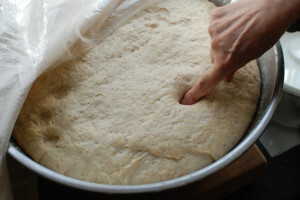 Knead dough again (about 5 or 10 punches), re-cover with plastic and blankets, and let it rest about 30 minutes or until it puffs back up to double original size. 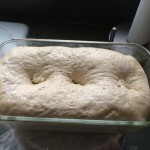 Shape into free form loaves or use oiled loaf pans. 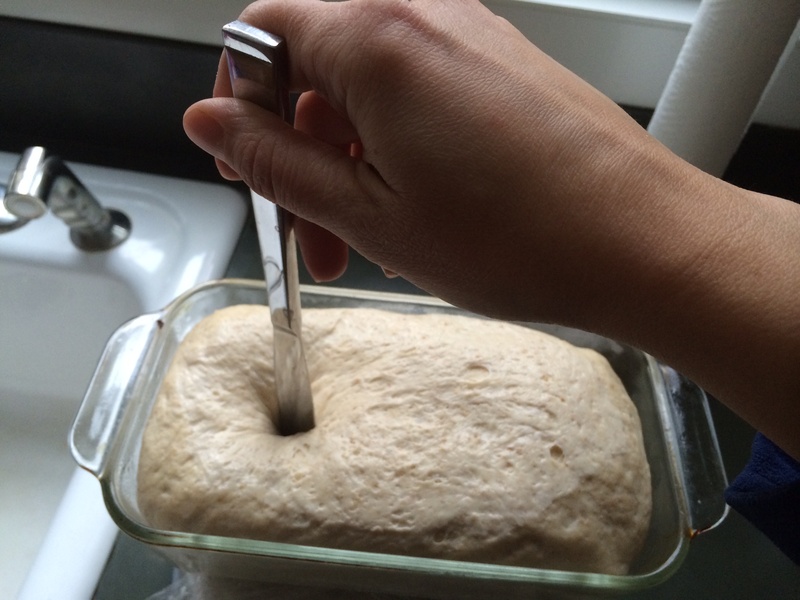 Use a knife to poke a few holes in the top of each loaf before placing them in the oven. 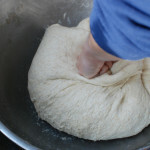 Bake at 350 degrees for about 1 hour or until the bread is golden brown and makes a hollow sound when you knock on it. Let cool for at least 30 minutes. Slice. Devour. 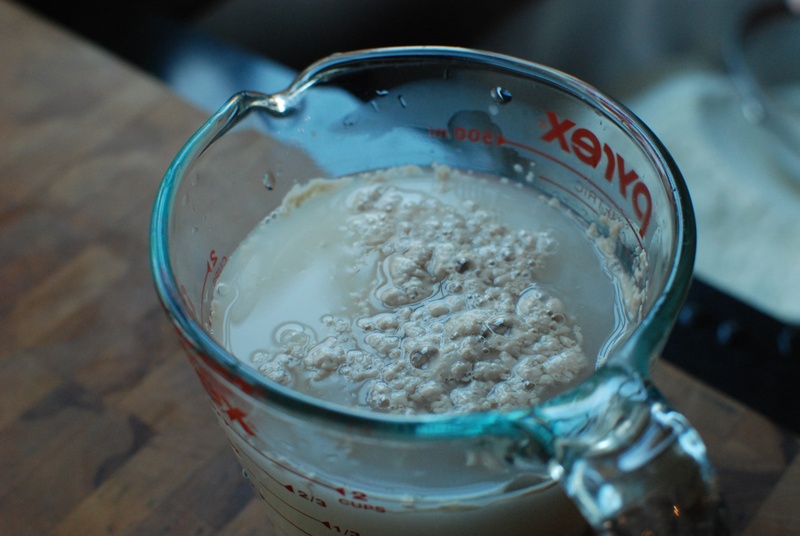 Combine yeast and 2 cups warm water in a small bowl and set aside to allow yeast to activate. 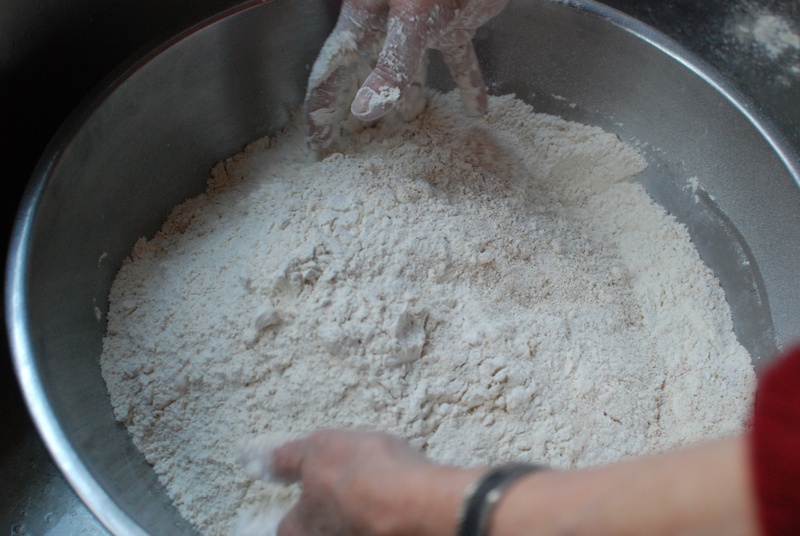 Sift white and wheat flour into large bowl to aerate the flour. 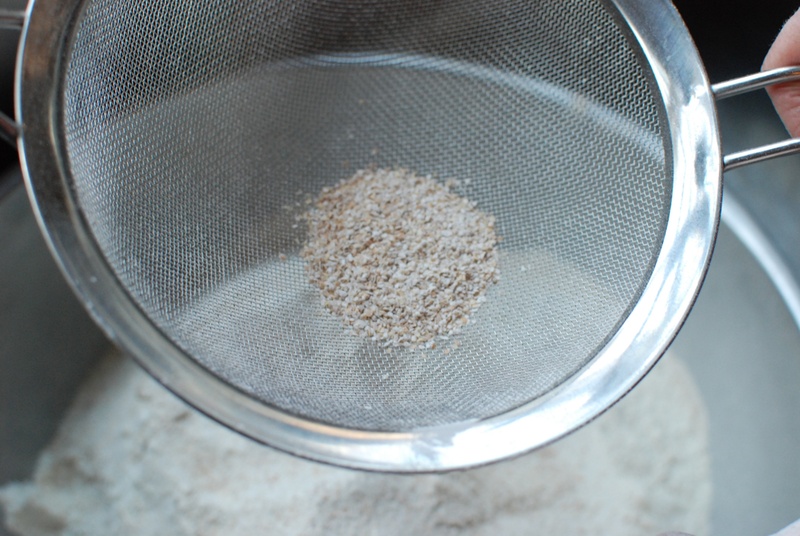 After you sift the wheat flour there may be larger wheat husks left behind in the sifter. Add those into the bowl, too. 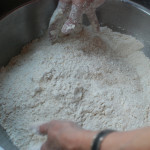 Add salt and combine with your hands. 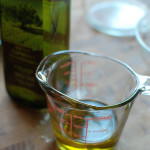 Make a well in the center and add oil. 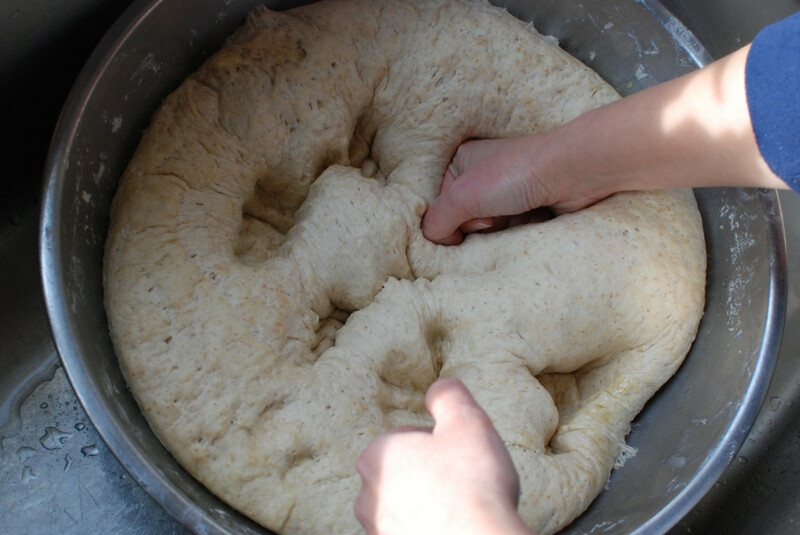 Stir the yeast and water that you set aside earlier and add this to the well. 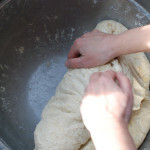 Knead the dough until it is sticky and tough and pulls away from the bowl. 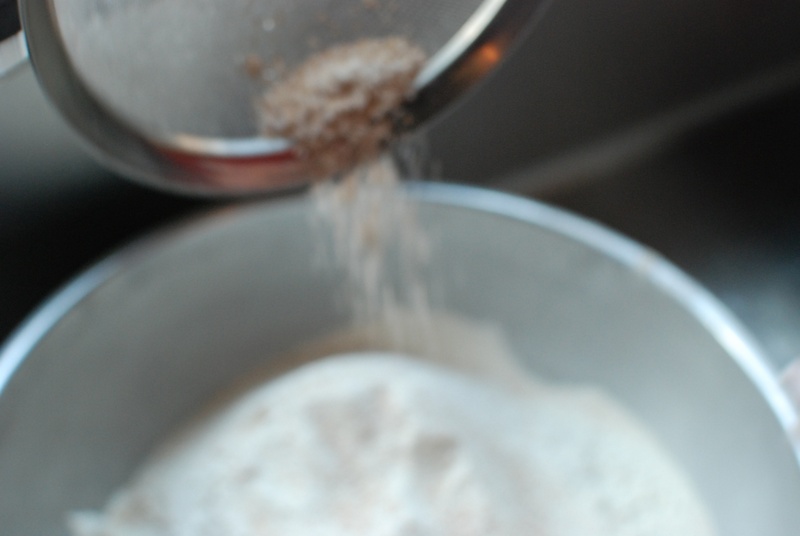 Fill a large bowl with 3-4 cups of warm water. 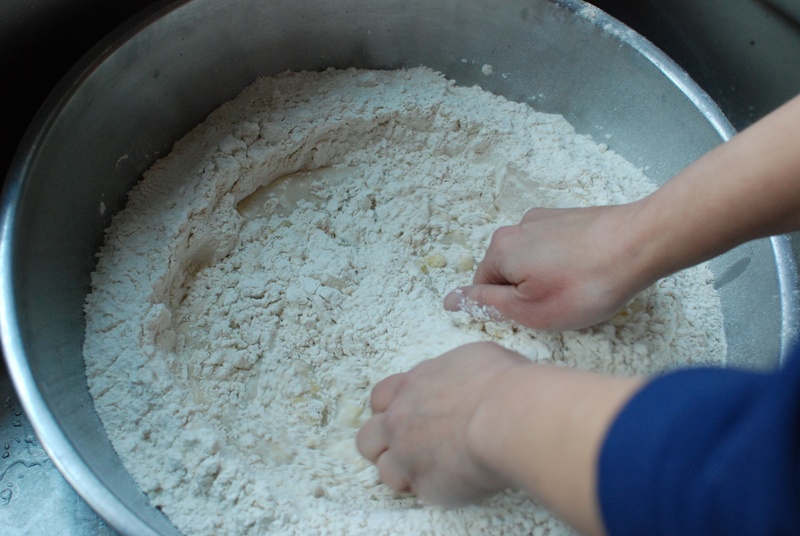 Wet your hands in the warm water and continue to knead the dough, repeating this process (wet hands, knead) until the dough has softened up a bit, the sides of the bowl are clean, and excess water has been absorbed. 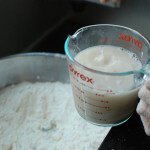 (You should use up most or all of the 3-4 cups of warm water during this process.) 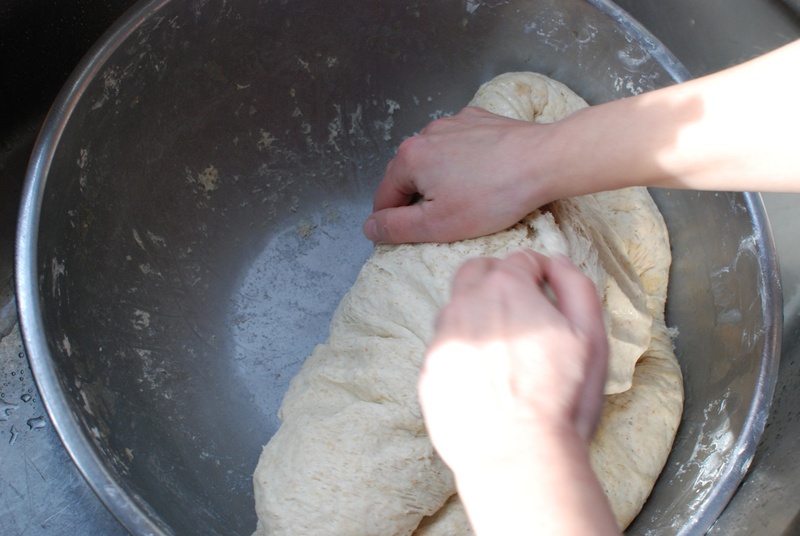 Cover the dough with plastic wrap and then with blankets to keep it warm. 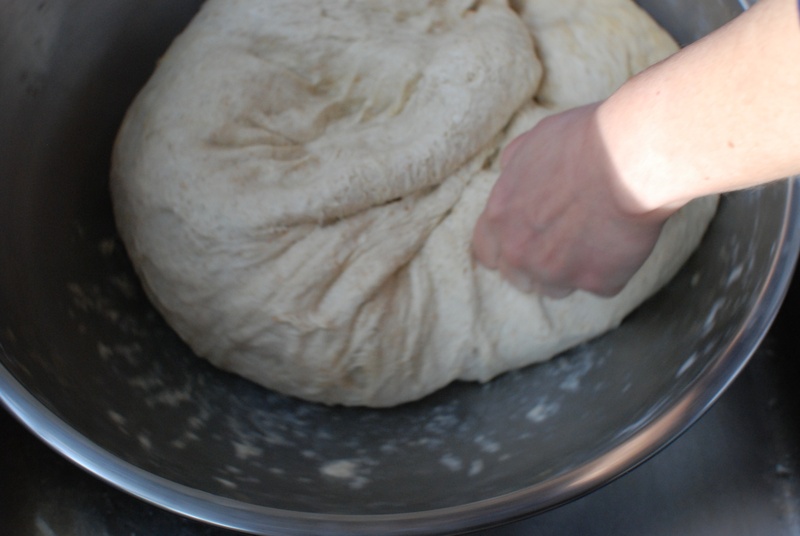 Let the dough rise for 2 hours or until it has doubled in size and springs back when you press on it. 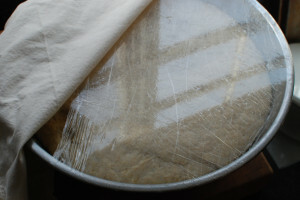 Knead dough again (4-5 punches), re-cover with plastic wrap and blankets, and let it rest about 30 minutes or until it puffs back up to double the original size. 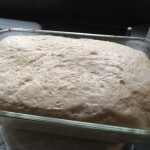 Shape into free form loaves and place on a cookie sheet, or use oiled loaf pans. 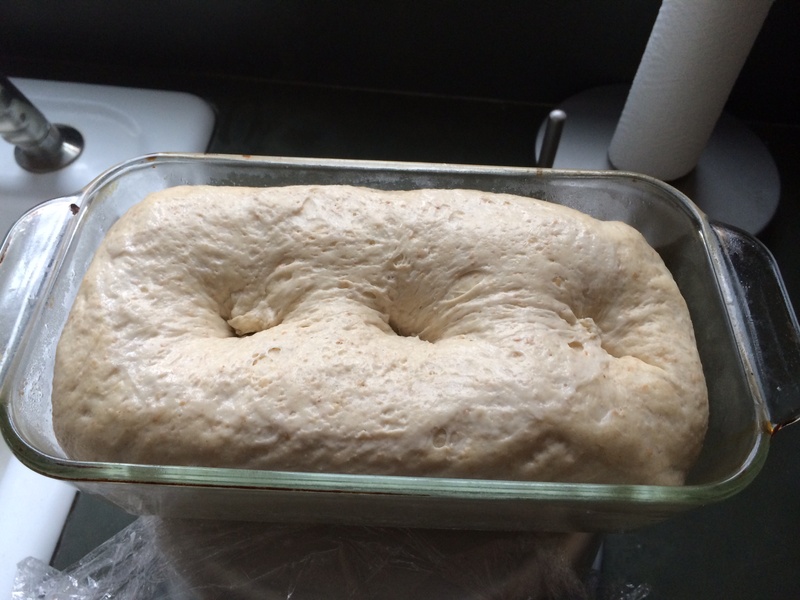 Bake at 350 degrees for about 1 hour or until the loaves are golden brown and sound hollow when you knock on them. This entry was posted in Lent, Uncategorized on February 13, 2014 by cousins.